Student Parents, this one is for you! We’ll provide the food, all you need to bring is your little ones and their favourite teddies! 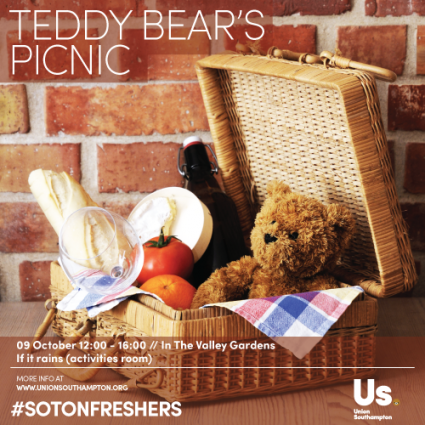 We’ll be holding it at Valley Gardens, but if the sun doesn’t come out, nothing will stop us picnicking – come to our Activities Room in the Union building (42) and we’ll host it there. “When Po’s long-lost panda father suddenly reappears, the reunited duo travels to a secret panda paradise to meet scores of hilarious new panda characters. But when the supernatural villain Kai begins to sweep across China defeating all the kung fu masters, Po must do the impossible-learn to train a village full of his fun-loving, clumsy brethren to become the ultimate band of Kung Fu Pandas” – 21st Century Fox. Rotten Tomatoes gives it 87%, but how would you and your family rate it? Pop down to Union Films (next to The Diner) at the Union (B42) with your loved ones to watch this family friendly comedy for free courtesy of our Union. An evening hosted by our specially selected experts, showcasing a range of the fine wines that our Bridge Bar has to offer. The wine is accompanied by a selection of the finest local cheeses, which are paired and prepared by our very own Michelin trained chef. Experience the art of coffee in our masterclass led by Dhan Tamang, winner of the UK Latte Art Championships for four years running. You will learn the origin of coffee, different brewing methods and even have the chance to create and sample your own work of art. Enjoy this classic British tradition as you relax with a cuppa and chat with your new friends for free! It’s February 1939 and, down in deepest Cornwall, the Tiddles & Son Antiquarian Bookshop is open for business… but where is the owner? And where is Lady Pogley’s sheep? Join 368 Theatre Company as the local police investigation uncovers some dark secrets – can you help them piece the clues together to make an arrest, and win a bottle of bubbly in the process? An evening spectacle of live interactive performance, complete with a 3 course meal prepared by our Michelin trained chef. Don’t worry, you will not be required to take part. This delectable 3 course menu prepared by our Michelin-trained chef has been confirmed for the evening! Don’t hang about and get your tickets at unionsouthampton.org/boxoffice – they are selling fast! Join us for a special evening performance from a fantastic headliner, with support. Dagenham-born Pascoe has featured on Live At The Apollo, Mock the Week and The Thick of It. Her next stop is The Cube – make sure you get yourself a seat to guarantee yourself a night of laughter and fun! Star of BBC’s Live At The Apollo and winner of the Edinburgh Comedy Award, Russell Kane, will be hitting The Cube stage to bring you a night of comedy and entertainment. Get to know other mature students and student parents at our free welcome BBQ. Don’t forget to check out our Mature Student and Student Parent Network (MSSPN) group. Because you can never have too many BBQs! Get quizzical at this postgraduate favourite. If you feel like Schmidt from New Girl, Don’t worry!